In Vitro Methods in Pharmaceutical Research provides a comprehensive guide to laboratory techniques for evaluating in vitro organ toxicity using cellular models. Step-by-step practical tips on how to perform and interpret assays for drug metabolism and toxicity assessment are provided, along with a comparison of different techniques available. It is a welcome addition to the literature at a time when interest is growing in cellular in vitro models for toxicology and pharmacology studies. Ideal for pharmacologists and toxicologists in academia and industry. This book will also have great bulk sale potential. D.W. Straughan, J.H. 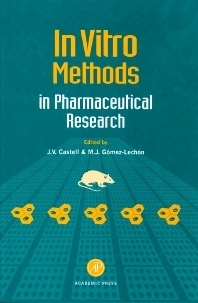 Fentem, and M. Balls, Replacement Alternative and Complementary In Vitro Methods in Pharamaceutical Research. M.D. Barratt and M. Chamberlain, Integration of QSAR and In Vitro Toxicology. F.A. Barile, Continuous Cell Lines as a Model for Drug Toxicity Assessment. P. Bach, In Vitro Models for Nephrotoxicity Studies. A.E.M. Vickers, Experimental In Vitro Models to Evaluate Hepatotoxicity. M.J. Gomez-Lechon, T. Donato, X. Ponsoda, R. Fabra, R. Trullenque, and J.V. Castell, Isolation, Culture and Use of Human Hepatocytes in Drug Research. E. McFarlane-Abdulla, and I.C. Campbell, Studies of Nephrotoxicity in Cellular Studies. M. Adolphe, S. Thenet-Gauci, and S. Demignot, Chondrocyte Culture: A Target System to Evaluate Pharmaco-Toxicological Effects of Drugs. E. Chacon, D. Acosta, and J.J. Lemasters, Primary Cultures of Cardiac Myocytes as In Vitro Models for Pharmacological andToxicological Assessments. R. Roguet, Cutaneous Pharmacotoxicology In Vitro. M.A. Miranda, Phototoxicity of Drugs. I. de G. Mitchell and R.D. Combes, In Vitro Genotoxicity and Cell Transformation Assessment. B. Schmid, R. Bechter, and P. Kucera, The Use of Whole Embryo Cultures in In Vitro Teratogenicity Testing. J.V. Castell, M.J. Gomez-Lechon, X. Ponsoda, and R. Bort, In Vitro Investigation of the Molecular Mechanisms of Hepatotoxicity. A. Guillouzo, Biotransformation of Drugs by Hepatocytes. K. Mace, E.A. Offord, and A.M.A. Pfeifer, Drug Metabolism and Carcinogen Activation Studies with Human Genetically Engineered Cells. J.V. Castell is a member of the Scientific Advisory Board of the European Union's Centre for the Validation of Alternative Methods (ECVAM).